So the Moon...tricky major for a tricky concept, I suppose. 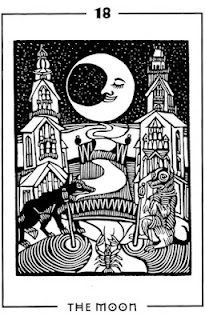 The Moon has always been a card, kind of like the High Priestess actually, where I kind of instinctively KNOW what it is talking about and yet it is often difficult for me to put that properly into words, both in general and sometimes, in the context of a reading as well. Now that I think about it, perhaps this makes the actual art in a deck especially important: for cards where I am comfortable with the meaning, know how to articulate it well, any art will do; it might add nice extra layers or nuance, but the basics can be applied to anything. On the other hand, with something a bit less...clear...art can really help or challenge you, depending. In general, the moon is kind of the opposite of the Star for me, art-wise. In this case, few decks have a Moon card that I really find stunning, even many of my most favorite decks... But of course, going through my collection I did indeed manage to find and choose two that are quite lovely. Simple/small thing though it may seem to be, one of the things I like best about this card is the color scheme. The slightly muted purples go perfectly with the back, grey, and white, and the combination gives the card a moodiness that fits just PERFECTLY with the meanings of the card, for me. I love the water and moon connection, and the way that the dog is incorporated here. 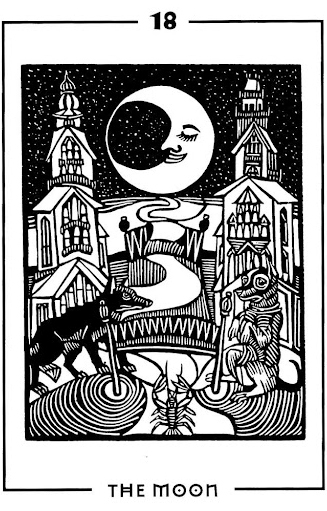 Usually we have the dog or dog-like figures in moon cards howling or standing guard, but here it is swimming in the water - at once both struggling to stay afloat (very in keeping with the card's meaning) and also, potentially, providing some much needed comfort/companionship for the woman sitting in the crescent moon above. I love her posture there, so very much embodying...apathy, depression, indecision, uncertainty, despair...the way she sits on and at once becomes the moon, and the scorpion-tail there too, warning of danger and secrets and lies, potentially...the art is pretty straightforward stylistically, but very much to read here from my perspective. This take on the moon, everything together, just really speaks to me. Another lovely gem from the Light and Shadow tarot here. If it wasn't for the unfortunate size and cardstock, this really would be one of my top decks, I think. The black and white color scheme is great in general, and works especially well for a Moon card, to me at least. It's the details though, that really make this image shine for me. I love the contrast between the two dogs, the one on the left looking extremely aggressive, the one on the right far too sad, apathetic. I love how the water between them, with the lobster/crab at its foot, slowly turns into a bed, into night and dreams and the land of the not-quite real. Are those two towers even real, then? The art itself leaves you with questions and uncertainty, a certain blur in concept that fits perfectly with what the Moon means. The actual crescent itself here seems to be sleeping contentedly, but given everything else we see on the card...well, lots of room to interpret, shall we say. Lots of food for thought here.